Inverness, Palatka, Deltona and Everglades City were designated as new trail towns by the Florida Greenways and Trails Council on January 23. Inverness, located along the 46-mile Withlacoochee State Trail, has embraced bicycle tourism as an economic driver. With good signage, amenities, numerous events, and safe bicycle and pedestrian passage through downtown, Inverness is creating a highly visual gateway to downtown along the trail. Palatka is an emerging trail hub, situated along long-distance paved multi-use trails, the St. Johns River Blueway and historic Bartram Trail in Putnam County. The town's interactive St. Johns River Center provides trail information and maps and the Palatka Bicycle Weekender draws hundreds of participants each year. Deltona is a hub for several long-distance multi-use trails such as the Florida Coast-to-Coast Trail and the St. Johns River-to-Sea Loop. The town has also embarked on an ambitious program to link their many parks by trail. Everglades City is a gateway to the Ten Thousand Islands and an important hub for several paddling trails, including the Florida Circumnavigational Saltwater Paddling Trail. The town is also bike-friendly as evidenced by bicycle racks throughout town and at the airport. As more Florida trail towns are designated, the Office of Greenways and Trails is developing story map tours for each town. A story map tour consists of a location map and eight to 10 photos with descriptions that can be advanced like a PowerPoint. The tours help web users become more familiar with the unique reasons why each particular town was designated. Hurricane Michael impacted many communities along Florida’s Panhandle. 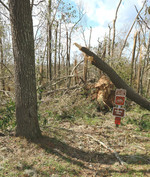 High winds and storm surge tore through several Florida State Parks, including Torreya, Three Rivers and Florida Caverns, which suffered major damage to the mature forest canopies. It will take time for hiking and walking trails to reopen due to downed trees, but staff and volunteers are actively working on clean-up and repair efforts. The 1,515-mile Florida Circumnavigational Saltwater Paddling Trail was impacted with the closure of St. George Island State Park and part of the St. Andrews State Park campground along with private campgrounds and motels. Long distance paddlers should take the Intracoastal waterway route and utilize the trail angel network coordinated by the Florida Paddling Trails Association. "Over my career, I've delivered and participated in many training sessions and this one ranks as my best experience ever! I've already framed out changes to our St. Lucie County paddling program and I'm eager to start working on my skills." The training involves 16 hours with expert American Canoe Association (ACA) instructors who coach attendees through the rigorous ACA Coastal Day Trip Leader course. This course focuses on risk assessment and group management. The next training will take place May 21-24, 2019 at Lake Louisa State Park. Class size is limited. Contact doug.alderson@FloridaDEP.gov for more details. Mississippi resident Camille Richards is the first paddler of the 2018/2019 paddling season to finish the entire 1,515-mile Florida Circumnavigational Saltwater Paddling Trail. 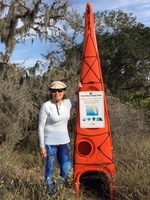 Paddling to raise awareness and support for adults with congenital heart defects, she paddled the trail in segments over three years and ended Dec. 30, 2018, at Fort Clinch State Park near Fernandina Beach. "Doing this was a huge accomplishment for me mentally and physically," she said. St. Marks Trail Extension: The grand opening of the new Stadium Enclave/Lake Elberta extension of the Tallahassee-St. Marks Historic Railroad State Trail occurred on Nov. 14, providing a new option for pedestrians and cyclists to connect to Gaines Street and Florida State University. The extension has been in the city of Tallahassee's plans for more than 20 years and became a reality when necessary land and right-of-way was acquired by Zimmer Development Corporation for the Stadium Enclave Student Living Center. Speakers at the event included City Commissioner Nancy Miller and Florida State Parks Director Eric Draper. Palatka-to-Lake Butler State Trail: After 27 years of planning, residents and visitors celebrated a 6-mile trail opening on Dec. 8 from Carraway to Palatka on the Palatka-to-Lake Butler State Trail, making the trail a continuous 28 miles from Keystone Heights to Palatka. The event, hosted by the Barnes family on the trail just west of Palatka, included brief talks, ribbon bike painting, bike rides, hikes, bike give-aways, dinner, blue grass music, and a campfire. Palatka-to-St. Augustine State Trail: With the recent completion of the Hastings segment, the 20-mile Palatka-to-St. Augustine State Trail is now finished. It is part of the longer 260-mile St. Johns River-to-Sea Loop. The celebration for completion of the Hastings segment will occur Saturday, April 6, in Hastings. Spring-to-Spring Trail: A 1.2-mile segment of the Spring-to-Spring Trail in west DeBary was recently completed with Florida Shared-Use Nonmotorized (SUN) Trail program funds. 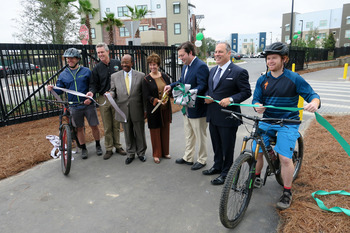 More than two-thirds of the planned 26-mile Spring-to-Spring Trail is now complete, a part of the developing 260-mile St. Johns River-to-Sea Loop. Legacy Trail Extension: In November, Sarasota County voters approved a plan to spend $65 million to connect the 11-mile Legacy Trail to downtown Sarasota for a total 6-mile extension. The plan includes acquisition and paving the trail along with constructing overpasses, restrooms and water fountains. The trail will also branch to the south and east. More than 225,000 bikers, walkers and runners used the Legacy Trail last year. Ludlam Trail Corridor: Miami-Dade County has acquired the property to develop the 5.6-mile Ludlam Trail at a cost of $24.5 million. The acquisition is a significant milestone for a project that has been envisioned since 1998. More than 35,000 Miami residents live within a half-mile of the trail corridor. Lake Lizzie Florida Trail Addition: With newly opened conservation lands in Osceola County, a gap in the Florida National Scenic Trail is being closed. 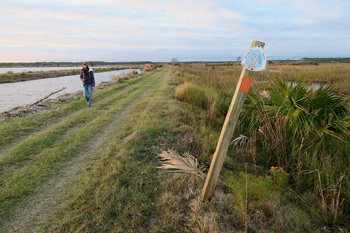 On Jan. 25, a ribbon-cutting was held for a new 3.5-mile segment of the Florida Trail in the Lake Lizzie Conservation Area. North Fork of the St. Lucie River: The Florida Greenways and Trails Council recently approved the North Fork of the St. Lucie River as a state designated paddling trail. Florida has more than 2,500 miles of hiking trails open to the public in addition to 4,758 miles of shared-use trails available to hikers. Hiking opportunities in Florida include the 1,300-mile Florida National Scenic Trail, one of 11 congressionally designated National Scenic Trails in the United States. Florida celebrates Hiking Trails Month in February, when low humidity and few bugs make it a great time to be outside. In March, the state celebrates Florida Bicycling Month. With Florida’s ever-expanding system of mountain bike and paved off-road trails, opportunities are numerous for safe and adventurous cycling. Several cycling festivals are held throughout the state during the year, so be sure to peruse the Office of Greenways and Trails online calendar to find an event near you. While recently navigating one of my favorite off-road bike trails, Red Bug Trail at Elinor Klapp-Phipps City Park, I noticed clusters of people with garden tools and shovels. Their bright green shirts identified them as volunteers with the Tallahassee chapter of the International Mountain Bike Association. Having just joined the organization at the suggestion of local chair Jimmy Card, I stopped to say thank you and chat with the trail workers. I am so inspired meeting and talking to park volunteers. Their comments reinforced one of the best things about parks and people — voluntary service. Trails like Red Bug and the parks where they are found benefit so much from volunteers and groups like the mountain bike club. The Florida Park Service benefits from the nearly 15,000 volunteers who make our state parks and trails great. From staffing the ranger station to clearing trails after storms, volunteers make a huge difference, and not just in state parks. Local park and trail systems, other public lands, museums and cultural sites that enrich our lives all depend on the efforts of people who simply enjoy helping. During a visit to St. Andrews State Park, which was severely impacted by Hurricane Michael, I watched a husband and wife team hauling away branches and debris. Their efforts, along with the help of many other dedicated volunteers and staff members, allowed the park to open sooner, returning a sense of normalcy to that community. Even though my job keeps me busy, inspired by the efforts of others I am going to commit to volunteering every week. I also encourage you to seek volunteer opportunities related to your interests and skills. 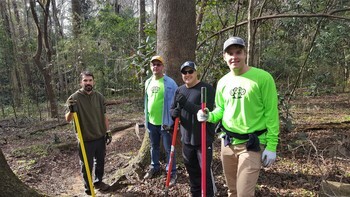 For opportunities at Florida State Parks, see our volunteering page at FloridaStateParks.org. For other statewide volunteer opportunities, visit VolunteerFlorida.org. About one thousand people a day, or 365,000 a year, hike sections of the Florida National Scenic Trail each year. According to the American Heart Association, for every dollar spent on walking paths and programs, about three dollars in medical expenses can be saved. The Florida Park Service has launched the Park Fit program as an alternative to traditional gyms. More than 2.6 million people visited the Cross Florida Greenway last year, the highest visitation of any state park unit.